ONE Fighting Championship™ (ONE FC) announced that all the fighters have made weight and are ready for ONE FC: MOMENT OF TRUTH which takes place on December 6, 2013 at the state-of-the-art MOA Arena in Manila, The Philippines. 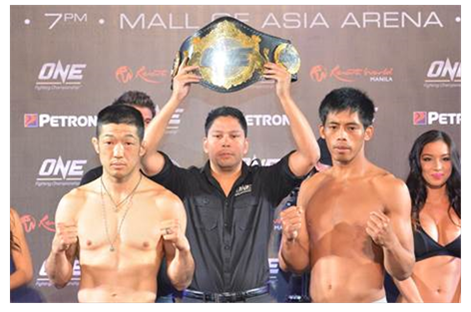 The card will be headlined by a ONE FC Featherweight World Championship bout between Honorio Banario and Koji Oishi. The entire card will also be available live on Pay-Per-View at www.onefc.livesport.tv. Tickets for ONE FC: MOMENT OF TRUTH are on sale now at SM Tickets (www.smtickets.com). Ticket categories begin with the full Red Carpet and cageside experience for VIPs at PHP 6,360 followed by Patron PHP 3,180, Lower Box PHP 1,280, Upper Box PHP 640 and General Admission PHP 220. Fans in Asia can catch all the action live on STAR Sports. Check your local listings. Also, fans from around the world can witness the action online via live streaming at www.onefc.livesport.tv.